Metals and insulators are easily distinguished just by looking at the filling of electronic bands. Partially filled bands correspond to metals while completely filled bands give rise to insulating behavior. However, transition metal oxides, with partially filled d-electron bands are either poor conductors or often insulators. The failure of band theory in these materials stems from the importance of electron-electron correlations. As Mott pointed out, the strong Coulomb repulsion between electrons splits the electronic bands in a lower occupied and an upper unoccupied band making the material an insulator (known as Mott insulator). Another striking consequence of strong electron correlations is the transition from the Mott insulating phase to a metal with the concomitant change in resistance by several orders of magnitude. The metal-insulator transition (MIT) in transition metal oxides has been a long-standing topic of research both from a theoretical and experimental point of view. In particular, two of the phases from the family of vanadium oxides are shown to be of great interest, namely vanadium sesquioxide (V2O3) and vanadium dioxide (VO2). The first one has a very rich phase diagram and is considered a paradigmatic example of a pure metal-Mott insulator phase transition. On the other hand, VO2 with a phase transition close to room temperature, has gained lot of attention due to the possible applications of MIT materials in devices. 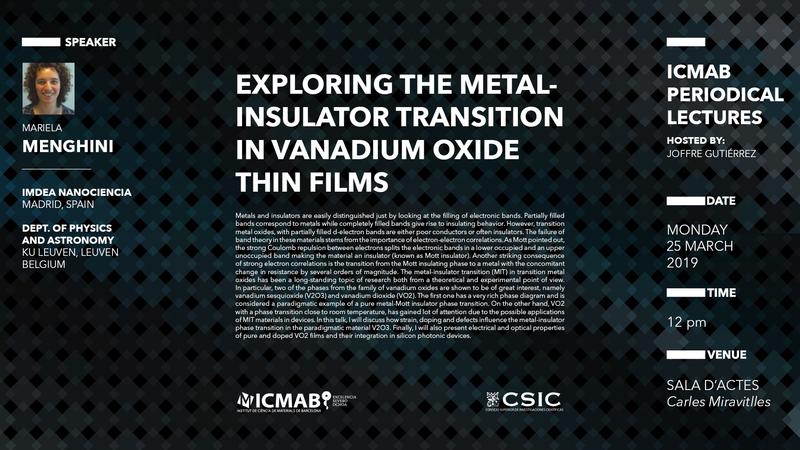 In this talk, I will discuss how strain, doping and defects influence the metal-insulator phase transition in the paradigmatic material V2O3. Finally, I will also present electrical and optical properties of pure and doped VO2 films and their integration in silicon photonic devices.